A faster processor, even longer battery life and a lower price solidify the 11-inch MacBook Air as the best ultraportable laptop value. Featuring a thin and lightweight design, the mid 2017 Apple 13.3" MacBook Air MQD42LLA features a unibody aluminum enclosure that weighs less than 3 pounds. At its thickest point, the computer is only 0.68" -- it tapers down to 0.11" at its thinnest. At 13.3" in size, the 16:10 display features a screen resolution of 1440 x 900. It features a glossy finish and LED backlight technology for enhanced image quality and energy efficiency. The system is loaded with 128GB of flash storage rather than an old-fashioned hard drive. Flash storage doesn't just give you a lighter, thinner computer. It also allows for impressive battery life -- up to 12 hours of web browsing and 30 days of standby time. The computer is powered by a 1.8 GHz Intel Core i5 dual-core processor and has 8GB of 1600 MHz LPDDR3 RAM. Graphics are provided by integrated Intel HD Graphics 6000. The computer features all the amenities you expect on a Mac -- a 720p FaceTime HD webcam, dual-band 802.11ac Wi-Fi (also compatible with 802.11a/b/g/n), Bluetooth 4.0, and built-in stereo speakers. macOS Sierra is the installed operating system. Working together with the power-efficient Intel Core architecture, the MacBook Air gets up to 12 hours of battery life on a single charge (may vary depending on use). That gives you all-day power for surfing the web or watching iTunes movies. Put MacBook Air to sleep for more than 3 hours, and it enters standby mode to conserve battery life for up to 30 days.This ultra-efficient architecture was designed to use less power and still deliver high performance. Which means not only can you do whatever you want - you can keep doing it for longer than before. MacBook Air supports dual-band 802.11ac Wi-Fi. When connected to an 802.11ac base station - including AirPort Extreme and AirPort Time Capsule - wireless performance is up to three times faster than 802.11n Wi-Fi. And your Wi-Fi range improves as well. With Bluetooth technology, you can connect the MacBook Air to Bluetooth-enabled devices, like speakers and headphones. Connect your MacBook Air to your devices and displays with a Thunderbolt 2 port that's twice as fast as the previous generation. MacBook Air also comes equipped with two USB 3.0 ports, so you can connect to USB 3.0 devices and all your USB 2.0 devices as well. Part of what makes the MacBook Air so responsive is that it's designed entirely around SSD storage. Not only does this make MacBook Air much lighter and more portable than traditional notebooks, it also provides faster access to data. The 128GB PCIe-based SSD storage is up to 17 times faster than a traditional 5400 rpm notebook hard disk drive. The MacBook Air gives you a 1440 x 900 screen resolution on a 13.3" display that measures a mere 0.19" thin. And LED backlighting makes colors bright and vibrant from edge to edge. Let your friends and family see more of you with the 720p FaceTime HD camera. And the widescreen format means everyone can fit into the picture without having to crowd around the display. If you're making a FaceTime call, the dual mics reduce background noise from behind the notebook. And when you use Dictation, they create an adaptive audio beam that intelligently adjusts to detect your voice - instead of the noise around you. The Multi-Touch gestures in macOS make everything you do on the MacBook Air more intuitive and direct, whether it's a three-finger swipe to activate Mission Control or a four-finger pinch to see all your apps in Launchpad. Gesture responses are smooth and realistic. As slim and compact as the MacBook Air is, Apple still managed to fit a full-size backlit keyboard, which provides a comfortable typing experience. And the keyboard is backlit, so you can type with ease in even the dimmest light. A built-in ambient light sensor detects changes in lighting conditions and adjusts the display and keyboard brightness automatically. 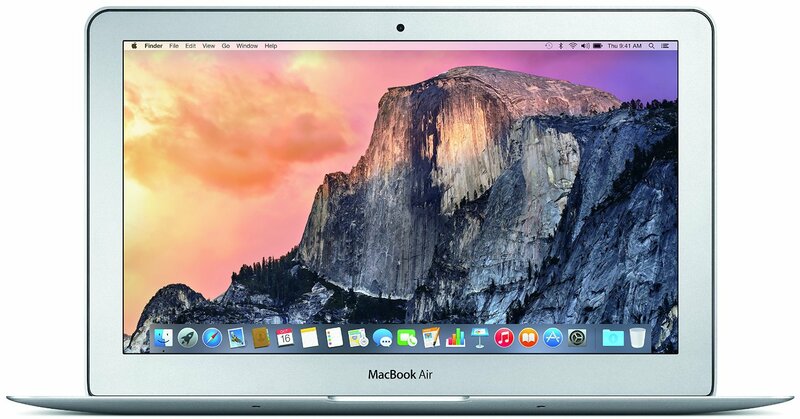 Order the MacBook Air and have it delivered to your doorstep within 1-3 working days or same-day within Nairobi. Payment on delivery.